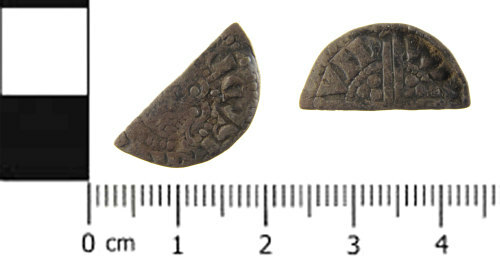 A silver Medieval coin; a cut half voided long cross penny of Henry III (AD 1216 - 1272), class Vc or Vg dating from AD 1250 - 1265. Mint of London, struck by Willam. See North number 993 or 997. The coin is 18.4mm long, 9.3mm wide and 0.7mm thick. 0.68g. On edge of the coin is slightly bent back. Obverse description: Forward facing bust holding sceptre.